MISSOULA – Members of the organizations Blue Skies Campaign and 350-Missoula participated in an act of nonviolent civil disobedience next to Montana Rail Link (MRL) tracks on Sunday, to prevent the passage of a coal train through Missoula. 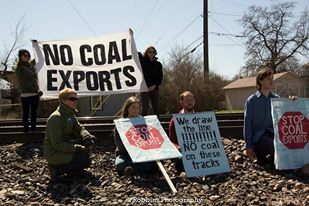 Seven people held a peaceful sit-in on MRL property and stretched a banner across the tracks, while about twenty people gathered nearby holding signs that read “Stop Coal Exports.” A coal train on its way to the West Coast was held up in Hellgate Canyon by the protest. The protesters gathered near the railroad at Madison Street and Greenough Drive, shortly after a coal train left Bonner on its way to Missoula. Five people sat down near the tracks, while the rest of the group gathered nearby with signs. The sit-in did not occur on the tracks themselves, but was meant to be close enough to the railroad that MRL would have to stop the train. Several coal trains per day pass through Missoula en route to the West Coast, where much of the coal is exported overseas through Canadian ports. Companies like St Louis-based Arch Coal want to build new coal export terminals in Oregon and Washington State, while opening vast new lands in Eastern Montana to coal mining. If this happens, the number of full and empty coal trains passing through Missoula each day could increase by as many as thirty. Both organizations involved in Sunday’s protest are concerned about the impacts of coal exports on the health of Montana communities and the global climate. Blue Skies Campaign is a volunteer-run, Missoula-based group that works to protect Montana communities from coal pollution. 350-Missoula is concerned about climate change and the impacts of burning fossil fuels. The group advocates for a transition to clean energy.